I think we have to stop reviewing candy. For one, I’m pretty sure we’ve reviewed everything. Last count we had 617 reviews on this site. The only reason there should be more candies than this is because of a Dentist Conspiracy. They don’t taste good. Sorry, they don’t. And I assumed my very discerning wife would spit these out. But no, she said she LIKED them because “they are citrus-y”. THEY’RE FINE? No, they aren’t fine. Fine is for something you would choose to eat. These aren’t that. Kid #2 said they’re Ok but they don’t really taste like Crush. My opinion (the one that matters) is closest to Kid #2’s take, except that she’d eat more of these – and if I wasn’t reviewing these, I wouldn’t touch them again. The packaging is the first f-up here. 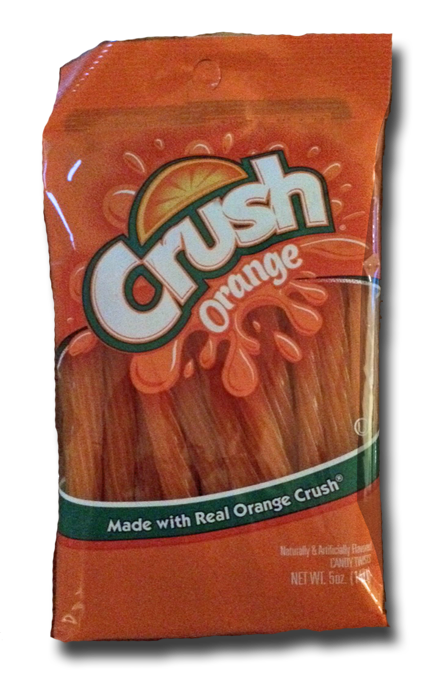 Like a can of Orange Crush soda, I wanted these candy twists right when I saw them. I wanted to love them. I was excited to rip open the package and dive in. But when I made that first tear and the aroma – more like an odor – wafted out, it wasn’t good. Somewhat orangey, sure, but more like old OJ concentrate and not bubbling pop. Kid #1 said it reminded her of an Orange Julius drink from the mall. But she’s wrong. This turned my blood orange!! Only 4 days ago I bought these and the next day I accidentally cut myself and it was orange! And it still is!